Mr Myer Morron, CEO of EFPConsulting Ltd. has updated his report on the SME Participation in the FP6 IST Program. His original report was used and quoted in the Gago Report. FP7 is a cornerstone of the <?xml:namespace prefix = st1 ns = "urn:schemas-microsoft-com:office:smarttags" />Lisbon strategy, which aims to increase European competitiveness. Leading by example, FP7 will be simplified in order to provide clearer themes and cost savings through its content, organisation and implementation. As part of our activities on the EPISTEP project, we have been attending and participating in European Technology Platform events. It has become clear that there are technical relationships between the platforms. One cannot describe them as "overlaps", as that would give the impression of duplication. We feel it more appropriate to call them "interfaces". In pursuing this topic further we have identified thirteen specific interfaces between the current eight ICT ETPs. We are currently incorporating this in a paper on the subject. It is interesting to note that some of these thirteen interfaces have already been identified by the platforms themselves. 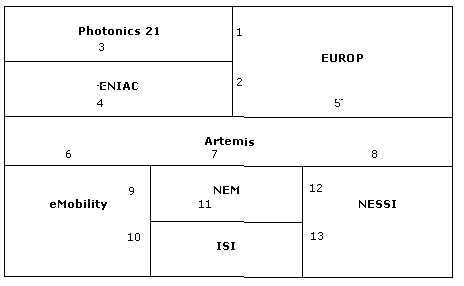 For example interface 4, above has been identified by Artemis and ENIAC and they have a joint Working Group defining their relationship. We wonder which others are already being addressed. The third annual conference of the embedded systems European Technology Platform ARTEMIS will be organised on 23 and 24 May 2006 in Graz, Austria. The conference, involving the main European stakeholder in this area addresses keynotes from industry and government on embedded systems, presentations on the realizations of the ARTEMIS Strategic Research Agenda as well as joint sessions between different Technology Platforms. 4. to get in touch with ETP players. If you prefer, you can also get in touch with EFPC for further information or assistance. The Commission has always encouraged projects to form themselves as legal entities via the EEIG (European Economic Interest Grouping) mechanism. However, it has been brought to our intention that members of an EEIG have to have a statuary official address in the EU and have carried out economic activity in the EU prior to setting up the EEIG. In effect this means that organisations from Associated Candidate countries and Associated States cannot be members of EEIGs and therefore would have problems participating in projects set up as EEIGs. The Finance Helpdesk issues free newsletters relating to FP6 Financial Rules, the new FP7 financial regulations and other things you should be aware of. Only those that register with the Finance Helpdesk will receive it. The Finance Helpdesk is partially funded by the European Commission and is part of the Finance-NMS-IST Project. Ethical reviews take place after the scientific evaluation and the results of the ethical review are used during contract negotiations. EFPConsulting staff have been heavily involved as evaluators in these Ethical Reviews and would strongly recommend that this aspect of proposals is taken seriously by proposers. Failure to address such issues properly may result in proposals being rejected. EFPConsulting now offers Ethical Review Red Teaming for proposals. The Chief Scientist Dr. Eli Offer and the director of the Incubator program Mrs. Rina Pridor, will be presenting at the BOOST-IT consortium meeting June 2006 in Tel-Aviv, Israel. The event will include an opportunity for the consortium partners to visit Israeli incubators and meet beneficiary SMEs. The partners are completing a large mapping activity, identifying the status, trends and key – actors in 19 technology sectors in the following countries: Bulgaria, Czech Republic, Estonia, Hungary, Latvia, Lithuania, Poland, Romania, Slovakia and Turkey. The meeting will be an opportunity for discussing completion of this activity with the consolidated report and opportunities for disseminating the information. EFP Consulting will be carrying out 3 Day FP6 Financial Workshop in Zagreb, Croatia (08 - 10 May). For more information, please click here.